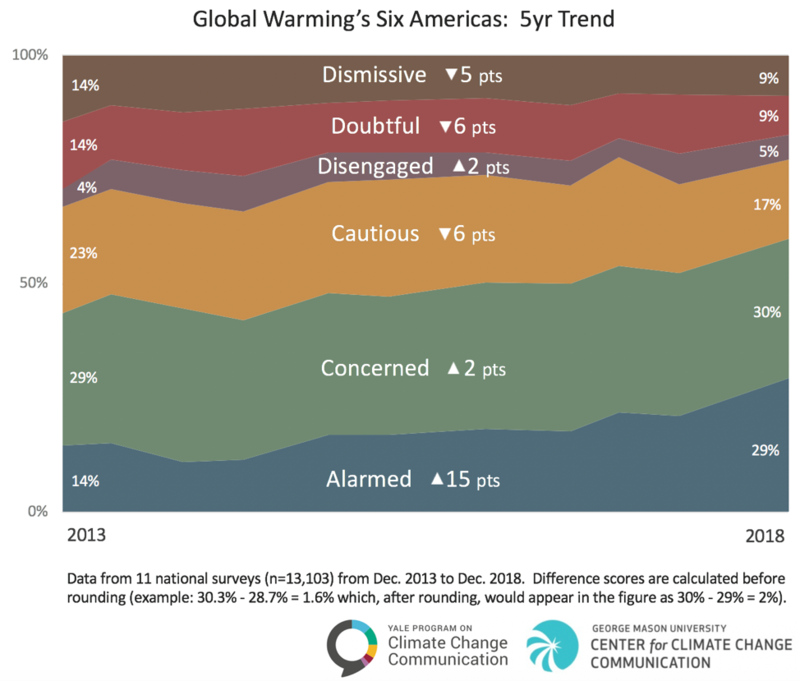 Six in ten Americans are now either “Alarmed” or “Concerned” about global warming. From 2013 to 2018, the proportion of “Alarmed” more than doubled. Our latest survey in December 2018 finds that the Alarmed segment is at an all-time high (29%) – which is double that segment’s size in 2013 and an 8-point increase since March 2018. Conversely, the Dismissive (9%) and Doubtful (9%) segments have both decreased over the last five years. The percentage of Americans in these two segments has declined by 12 points since 2013. These data were produced from 11 bi-annual waves (n=13,103) of the Climate Change in the American Mind survey — a nationally-representative survey of public opinion on climate change in the United States conducted by the Yale Program on Climate Change Communication and the George Mason University Center for Climate Change Communication. Surveys were conducted from December 2013 to December 2018 using the Ipsos KnowledgePanel® (formerly GfK), a representative online panel of U.S. adults (18+). All questionnaires were self-administered by respondents in a web-based environment. Average margin of error for the full sample: +/- 3 percentage points at the 95% confidence level. 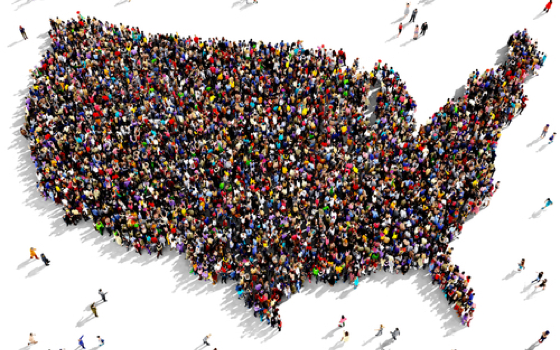 Percentage values are weighted to align with U.S. Census parameters. For tabulation purposes, percentage points are rounded to the nearest whole number. As a result, percentages in a given chart may total slightly higher or lower than 100%. Additionally, summed categories (e.g., Alarmed + Concerned) are rounded after sums are calculated (e.g., 29.4% + 30.4% = 59.8%, which, after rounding would appear in the report as 29% + 30% = 60%).